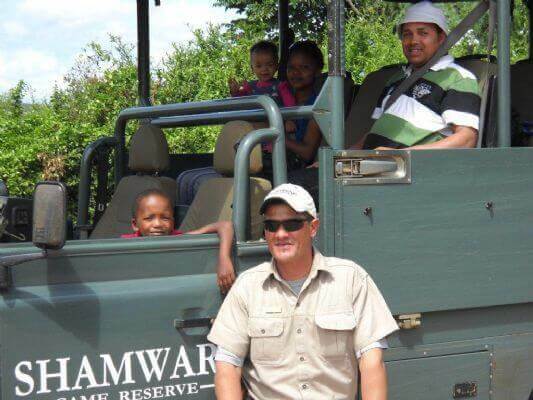 Recently a 5 year old boy named A-Jay came with his family to Shamwari Game Reserve for the experience of his lifetime. A-Jay, having been diagnosed with Hodgkin’s disease, had dreams of encountering elephants. A-Jay and his family spent an enchanted evening at Riverdene Children’s Lodge, where they enjoyed awesome game drives with their ranger Wesley, sumptuous meals and a whole lot more, as a perfect ending to a weekend of dreams come true. With the assistance of African Ramble Charters, owned by Mark Andrews, A-Jay and his family were also flown from Shamwari Game Reserve to a nearby elephant sanctuary where A-Jay got to experience more elephants up close and personal. An inter-reserve sports tournament was held on Saturday, 1 September in the community of Paterson, Eastern Cape. On the 18th of July we celebrated Mandela Day in honour of Nelson Mandela’s life and legacy. Nelson grew up in the Eastern Cape of South Africa. He was a South African anti-apartheid revolutionary, political leader, and philanthropist who served as President of South Africa. It has been a long journey but we are ecstatic to have met our goal! We handed Eunice’s house over to her on the 7th of December 2017, just in time for Christmas. It was a fantastic, sun-shining day that was celebrated by many in the small community of Paterson.